Discover how, with the right storage infrastructure, organizations can achieve higher returns. Innovative applications – salesforce automation, business intelligence (BI) and customer relationship management (CRM) – present new opportunities for businesses to know their customers better. Yet, they can place demands on the underlying architecture and storage hardware, which are often onerous for small and midsized companies. 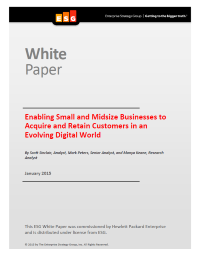 Download this white paper to learn how the supporting IT infrastructure impacts the value derived from intelligent applications and how HP provides affordable and functional storage solutions, leveraging software-defined storage to help solve the challenges.